On the other side of the issue, the classic and performance car world is seeing wear and premature failure problems with OEM and aftermarket flat-lifter cam valve trains, which throw doubt on these industry statements. Let’s break this complicated situation into its component issues and examine each issue from both viewpoints. ZDDP levels in motor oils have been reduced steadily since the time of SF oils in an effort by the automotive industry to comply with EPA guidelines regarding catalytic converter life. The most recent oil classification “SM” calls for no more than 0.08% phosphorus in motor oils. Phosphorus is one of the two major metallic constituents to ZDDP, the other is zinc. All oils are required to pass a battery of tests, including the Sequence III test, before they can obtain an oil industry certification. The Sequence III test utilizes a flat-lifter engine, and (among other parameters) is intended to quantify an oil’s ability to protect flat-lifters and other components against wear. If an oil has a certification, then it is safe to use in flat-lifter engines. Any wear being seen out in the field is due to improper break-in or inferior cam or lifter quality. We are seeing a marked increase in cam and lifter wear in both OEM cams as well as aftermarket cams, especially in high-performance, high-lifter-foot pressure engines. Many aftermarket engine rebuilders are switching exclusively to roller cams for this reason. This remedy does not help the classic or high-performance car owner who wants to keep an engine stock, or just plain does not want to rebuild his engine with a roller cam due to the expense or because the engine is running well. Why is the automotive industry insisting that no problem exists when we are dealing with it in increasing measure day after day? We know of no ASTM or other reported research which concludes that an oil with little ZDDP is compatible with older flat-tappet high-performance engines. This means that at the point of valve float, the dynamic pressure on the lifter foot is twice the static spring pressure times the rocker ratio, plus the frictional loading. While it is true that no engine is run at such a high rpm for any period of time, it makes the point that the lifter foot pressure in a high-performance engine can be much greater than that in a Sequence III test engine, which is run at a constant 3600 rpm with relatively weak springs. The older engines may have lifter foot pressures several times that of a low-performance engine such as those used in the Sequence III tests. Consequently, their wear characteristics are not entirely predicted by common Sequence III testing methodology. The fact is all test Sequences we have studied use non-performance engines with low spring-pressures, indeed in the Sequence IIIG test, the static lifter load is 350 pounds. Many high- performance engines have as much as 500 pounds or more of lifter foot pressure. Referring to the Bennet data, this would indicate that, in order to keep from scuffing, a ZDDP level of 0.065% minimum would need to be ensured. A factor not considered in this equation is that the ZDDP level steadily declines after initial oil fill due to the ZDDP being used up as it performs its job. 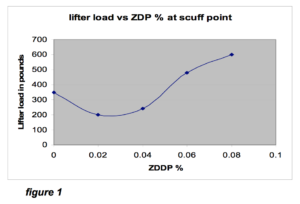 Referring to the ZDDP depletion chart in figure 2, monitoring the actual ZDDP levels using Infra Red Absorption Spectroscopy shows that as the components in ZDDP are plated out on moving parts, the ZDDP concentration in the oil drops accordingly. This particular chart was derived from a study performed by the Noria Co. and Wooten Consulting, with equivalent ZDDP levels overlaid on the raw absorptance data. The significance of using Infra Red Absorption Spectroscopy is that it indicates the amount of ZDDP molecules present, not just the presence of atomic phosphorus or zinc. When ZDDP is being depleted in an engine, except for extremely small amounts that are consumed in combustion, the phosphorus and zinc are still in the oil sump, but are in forms that are not active as EP agents. If one factors depletion into the equation for a high-performance motor with 500 pounds of lifter foot pressure, Bennet’s work indicates a ZDDP level associated with minimum level of 0.065% phosphorus would be required to inhibit scuffing. If an initial sump fill of a SL-type oil with ZDDP giving a 0.08% phosphorus level was used, the depletion curve as shown on figure 2 would indicate the phosphorous level would drop below the 0.065% point in the first 500 miles or less. This means if one desires a 3000-mile oil service interval and wishes to keep a high- performance flat-tappet engine protected, the initial ZDDP fill should give a phosphorous amount that is much higher than 0.08%. The actual rate of ZDDP depletion after an oil change will vary greatly depending on the application, but this data shows a potential pitfall to thinking the initial phosphorus level in the virgin oil is a constant. In the Barnes and Wooten article, they note that even though the ZDDP level is dropping, some additional EP protection is afforded by the ZDDP partial decomposition products, so there is probably some leeway in the actual depletion curve depicted in figure 2. Although the SM spec calls for a maximum of 0.08% phosphorus, we wish it were true that all modern oils contained even 0.08% phosphorus in the form of ZDDP. Our recent tests of two major name brand oils bearing the SM grade contain at or less than 0.06% phosphorus. We know there are technologies other than ZDDP which can function as effective EP anti-wear agents for some engine designs, as proven with newer engines with roller cam followers. The most recent SM formulations, in particular, have shown a move to Boron-based EP additives, with a concurrent further lowering in some oils to less than 0.06% phosphorus. 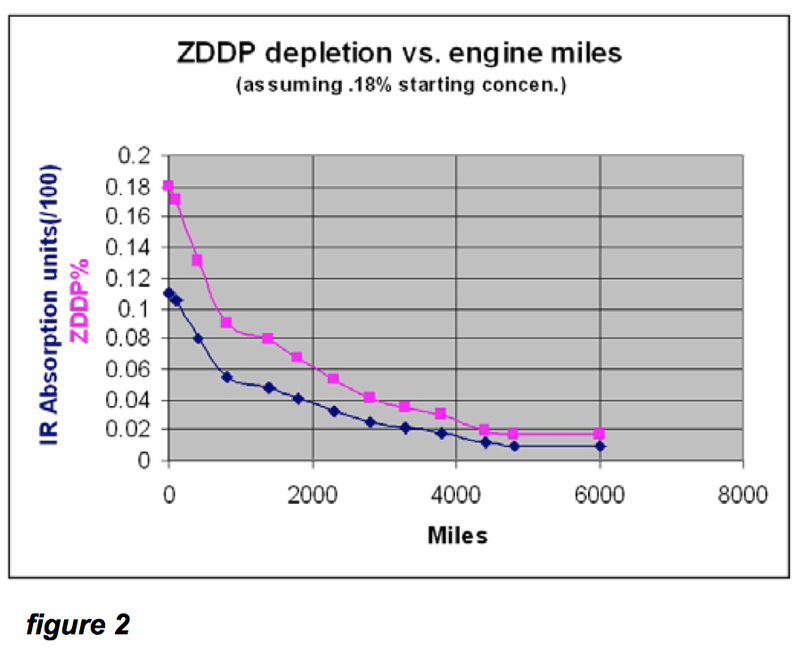 While this is good news for the owners of new cars with catalytic converters, it does mean that in order to retain the SM certification they both claim, there has to be an EP additive different than ZDDP incorporated into both formulas, or that neither was intended to be used in high-performance flat-tappet engines. Again, our study of the ASTM test sequences IIIE, IIIF, IIIG, IVA and VE required to achieve certification reveal that NONE were developed using high-performance engines. Indeed, these tests were developed using relatively low- performance engines intended to model average current and emerging vehicle engine wear characteristics. This makes absolute sense considering the purpose of the oiI specifications is to provide a standard set of performance criteria for oil to be used in new over-the-road automobiles and trucks. The standards are not intended to infer any degree of backwards compatibility with older or specialty engines. In one statement GM engineer Robert Olree, while investigating the amount of ZDDP needed to protect engines, stated: “Arguing that modern oils should pass tests developed 25 years ago to protect engines built 30 years ago is a rather useless exercise.”1 Since he is employed to design lubrication for the next generation of motors, his perspective is understandable. In saying this, he is acknowledging the test is not specifically designed to quantify an oil’s performance with older engines. Unfortunately, some of “those” engines are the ones we enthusiasts run and care about. The classic or high-performance car owner is left with a few choices if they want to provide their car with proven motor protection for their flat-tappet engine: Use modern specialty oils, which claim to have ZDDP levels at or near the level in heavy-duty SF oils OR Use a modern SM oil with a ZDDP additive to bring the EP protection up to that provided by the ZDDP level in SF oil. A check of current pricing on some specialty oils shows the average price per quart to be in the $8.00 and up price range, some as high as $12.00! This gives a 5-quart oil change a cost between $40.00 and $60.00. A cheaper solution is to buy a high-quality name brand SM oil of the exact viscosity range your engine calls for in gallon or 5-quart jugs. These can be found for between $12.00 and $25.00 for premium synthetic types. To this oil add the appropriate amount of a ZDDP EP additive to a target phosphorus level of 1300 to 1600 ppm. There are a few ZDDP additives on the market, namely ZDDPlusTM and the recently reintroduced GM EOS. The main difference between these two EP additives is the relative concentration and cost. In order to achieve a phosphorus level of 0.14%, you would need to add more than two bottles of EOS, and at $12.00 per bottle online, or $19.00 and up at the GM dealer, it would add $24.00 to $38.00 cost to the price of the oil. Using a single bottle of ZDDPlusTM at only $10 is more economical. Our conclusion and current recommendation is to augment one of the readily available, inexpensive new SM oils of the correct viscosity with additional ZDDP in order to bring the oil’s EP characteristics back to what was called for when the engine was designed. It is easier and less expensive than searching for a specialty oil. We know from years of oil testing, ZDDP is compatible with all base stocks and other additive packages, including the newer Boron EP additives. So, there is no risk in adding it to achieve the equivalent of 0.12 to 0.14% phosphorus, a level similar to that formulated into SF or SG oils. 1 Robert M. Olree and Michael L. McMillan, “How Much ZDP is Enough?,” SAE pub 2004-01-2986, (2004), 11.